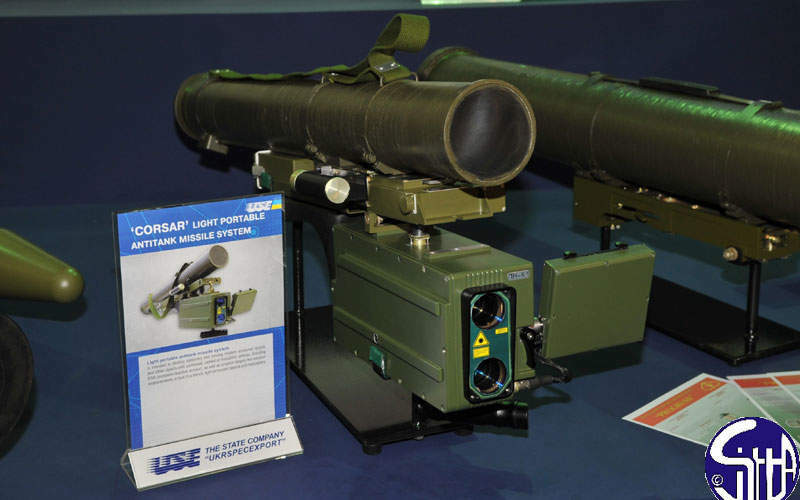 The Corsar anti-tank missile system is developed State Kyiv Design Bureau 'Luch'. The Corsar missile system is equipped with an 8x optical sight system for observation and aiming. Image courtesy of Ministère de la Défense. 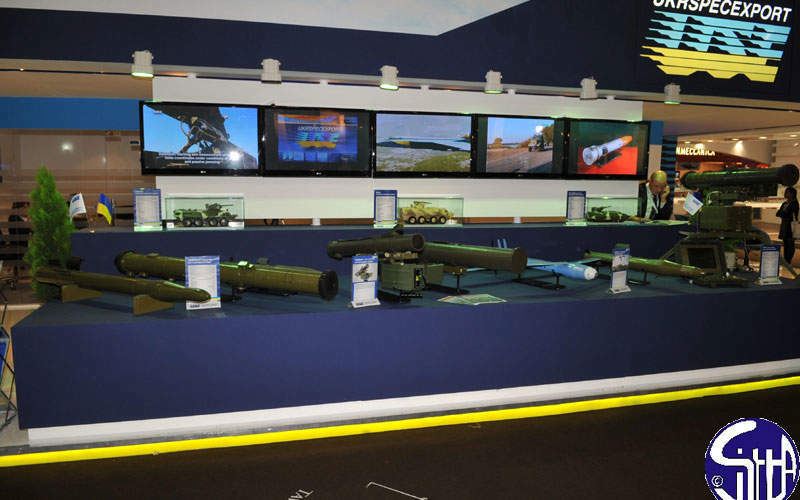 The Corsar missile portable missile system was exhibited during the IDEX 2011 exhibition held in Abu Dhabi, UAE. Image courtesy of Ministère de la Défense. 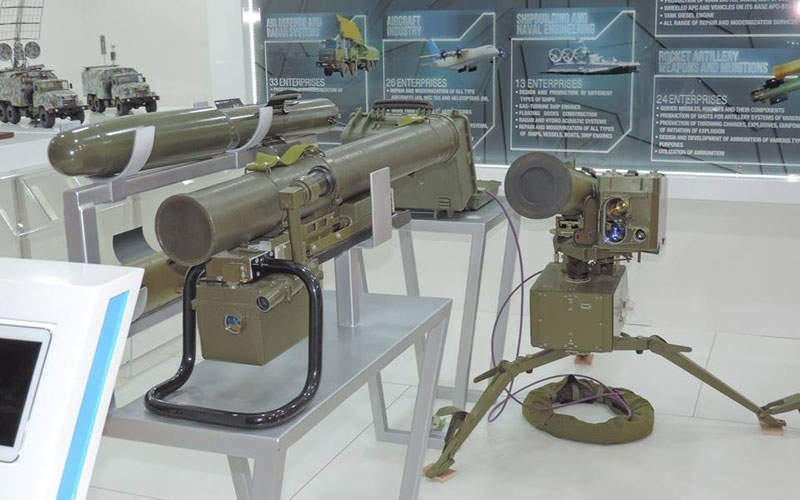 Corsar (Le Corsaire) is a light, portable anti-tank missile system designed and manufactured by Ukrainian state enterprise State Kyiv Design Bureau ‘Luch’ to provide war fighters with increased survivability against stationary and moving targets. The Corsar system can be used against a variety of ground targets including armoured tanks, high-speed assault boats, armoured vehicles, combat reconnaissance vehicles, and blockhouses. It can be fired at air-based targets such as helicopters and unmanned aerial vehicles (UAVs). It can also engage weapon emplacements, lightly armoured targets, tank in a trench, as well as other objects equipped with explosive reactive armour (ERA). A mock-up of the Corsar missile system was exhibited at the seventh International Defence Exhibition (IDEX) held in Abu Dhabi, UAE, in February 2005. The weapon underwent live-firing tests at a firing range near Kiev in July 2013. A prototype of Corsar was demonstrated at the 169 Land Forces training centre of the Armed Forces Desna of Ukraine in May 2015. The missile system is equipped with KrAZ Spartan armoured personnel carriers that are currently in service with the National Guard of Ukraine. The Corsar anti-tank missile system consists of a transport launching container (TLC) with RK-3 guided missile, missile launcher, and a guidance unit. It offers high accuracy and advanced range-of-fire capabilities. The 11.5kg RK-3 guided missile, having a length of 910mm and an outer diameter of 107mm, is stored in a TLC. The length and outer diameters of the container are 1,180mm and 113mm respectively. The missile is equipped with four wings, two tail control surfaces and a 3.7kg warhead. The total weight of the missile system is 26kg, while the missile in container weighs 15.4kg. The missile can be either shoulder-launched by a single operator from standing / kneeling position or fired from a launcher unit. The missile launcher has a length of 810mm, a width of 285mm, a height of 256mm, and weight of 5kg. Powered by lithium rechargeable battery, the launcher can perform 100 firings without recharging. The tandem hollow-charge warhead allows the weapon to penetrate up to 550mm of armoured targets behind explosive reactive armour. "The missile system is equipped with KrAZ Spartan armoured personnel carriers that are currently in service with the National Guard of Ukraine." The missile system can be equipped with explosive high-explosive fragmentation warhead with explosively formed penetrator (EFP), for armour penetration up to 50mm. The thermobaric warhead with 5.5kg TNT-equivalent further improves the missile’s hit accuracy. The semi-automatic laser beam guidance provides observation and target detection capabilities. It is immune to jamming, which enables the weapon to destroy targets protected by heavy electronic countermeasures. It also provides guidance in low-power radiation level to protect the control channel. The guidance section is 300mm long, 220mm wide, 216mm high, and weighs approximately 4.95kg. An optical sight system with an 8x magnified view is used for observation and aiming. The semi-automatic laser beam allows the operator to aim at the targets located at a distance ranging between 100m and 2.5km. The guidance unit also comprises axis parallelism control system, alignment device and operating channels. The anti-tank guided missile can attack targets up to a range of 2.5km and has a maximum flight time of 13 seconds at the maximum range. It can destroy low-speed evading targets. The weapon can operate in temperatures ranging between -40°C and 60°C. Mipro produces, delivers and upgrades fuzes and fuze components for use in subsystems for ammunition and warheads.